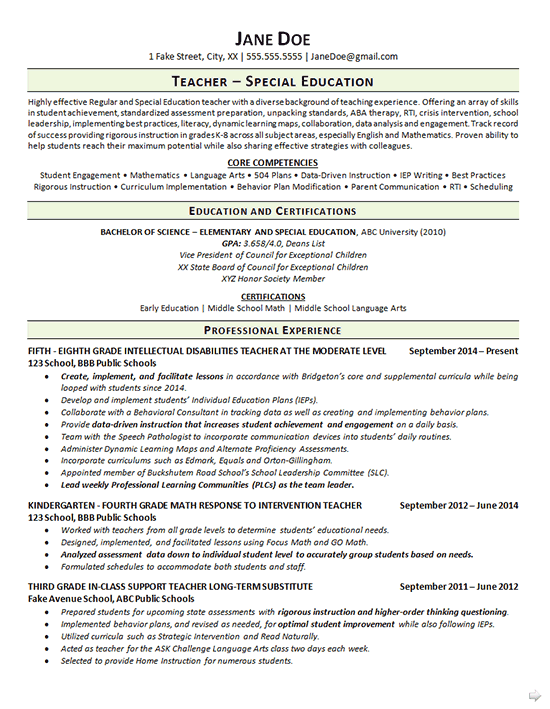 This resume was created for a beginning Special Education Teacher hoping to land employment closer to home. The teaching candidate is currently employed but has to commute over an hour to work each day. 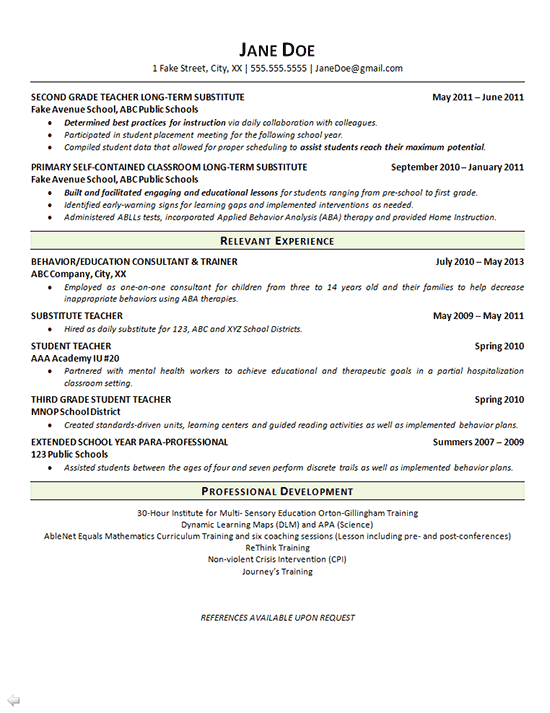 Since it can be difficult for less experienced teachers to stand out in large applicant pools, this resume began by highlighting Core Competencies that she has excelled in throughout their brief career. Additionally, an introductory paragraph was utilized to fully explain why they are a worthy candidate. Next, Education and Certifications were strategically listed to demonstrate that the job seeker is qualified for these teaching positions. While this teaching professional has less work experience, they possess an impressive Education background. The writer wanted employers to focus on her work ethic and potential instead of her brief work history. Following the Education section, employment history was explained in detail so that employers would be aware that she has worked in a variety of levels and districts. To conclude the resume, a Professional Development section was created to truly showcase that this client continuously works to improve and become a better educator. Highly effective Regular and Special Education teacher with a diverse background of teaching experience. Offering an array of skills in student achievement, standardized assessment preparation, unpacking standards, ABA therapy, RTI, crisis intervention, school leadership, implementing best practices, literacy, dynamic learning maps, collaboration, data analysis and engagement. Track record of success providing rigorous instruction in grades K-8 across all subject areas, especially English and Mathematics. Proven ability to help students reach their maximum potential while also sharing effective strategies with colleagues. Create, implement, and facilitate lessons in accordance with Bridgeton’s core and supplemental curricula while being looped with students since 2014. Develop and implement students’ Individual Education Plans (IEPs). Collaborate with a Behavioral Consultant in tracking data as well as creating and implementing behavior plans. Provide data-driven instruction that increases student achievement and engagement on a daily basis. Team with the Speech Pathologist to incorporate communication devices into students’ daily routines. Administer Dynamic Learning Maps and Alternate Proficiency Assessments. Incorporate curriculums such as Edmark, Equals and Orton-Gillingham. Appointed member of Buckshutem Road School’s School Leadership Committee (SLC). Lead weekly Professional Learning Communities (PLCs) as the team leader. Worked with teachers from all grade levels to determine students’ educational needs. Designed, implemented, and facilitated lessons using Focus Math and GO Math. Analyzed assessment data down to individual student level to accurately group students based on needs. Formulated schedules to accommodate both students and staff.